Race Red exterior and Ebony interior, EcoBoost® trim. Superb Condition, CARFAX 1-Owner, ONLY 2,162 Miles! 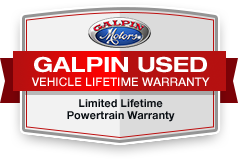 Onboard Communications System, iPod/MP3 Input, Smart Device Integration, Keyless Start, Aluminum Wheels, TRANSMISSION: 10-SPEED AUTOMATIC w/SE..., Back-Up Camera, Turbo Charged Engine, Serviced here at Galpin, Originally Sold at Galpin, Used Dealer Rental Vehicle.